At the end of the 2011 season, Ros made the decision to establish her own eventing business and her reputation has gone from strength to strength ever since. She enjoyed successful outings as part of the Great Britain Nations Cup team and, in 2015, achieved her first Land Rover Burghley CCI4* completion riding Allstar B – the pair winning the prize for best British first timers. They completed again in 2016, Ros having also been selected to travel out to Rio as part of the Ambition Programme, for a behind the scenes look at the Olympic Games. In 2017, Ros, riding Allstar B, finished 5th, best Brit and highest placed lady rider at Badminton. This earnt the pair a place on the British team for the European Championships in Strzegom, Poland where Ros finished 5th individually and won a team gold medal. Zenshera also posted two top 10 finishes at CCI4* level. In 2018, Ros had an extraordinary year. From the perspective of the big events, it kicked off with a third place at Badminton on Allstar B, followed by third at Luhmuhlen with Zenshera. Zenshera was also runner up at Millstreet, and finished Ros’ eventing season off with fifth at Pau, while Las Vegas gave her a first taste of the indoor Eventing Masters, taking the runner up spot in both Stuttgart and Stockholm. Ros finished the eventing season as World number two in the FEI rankings, with Allstar B and Zenshera taking the top two spots on the British Eventing points winning table. Ros was named Horse & Hound Professional Rider of the Year, but the biggest accolade of all, of course, was being crowned World Champion – alongside Allstar B, whilst leading Great Britain to the team gold medal. 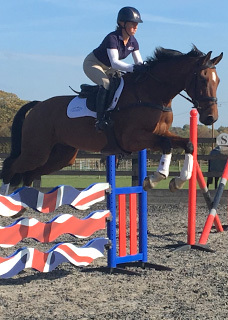 Jump 4 Joy are delighted to be supporting Ros for 2019, a year that will see a new addition to her family and possibly some competing towards the end of the year. It certainly promises to be an exciting one!